To configure multi-tab support, make sure the jump server and basic application settings have been set up. Mutli-tab is supported for application launching from a jump server only. 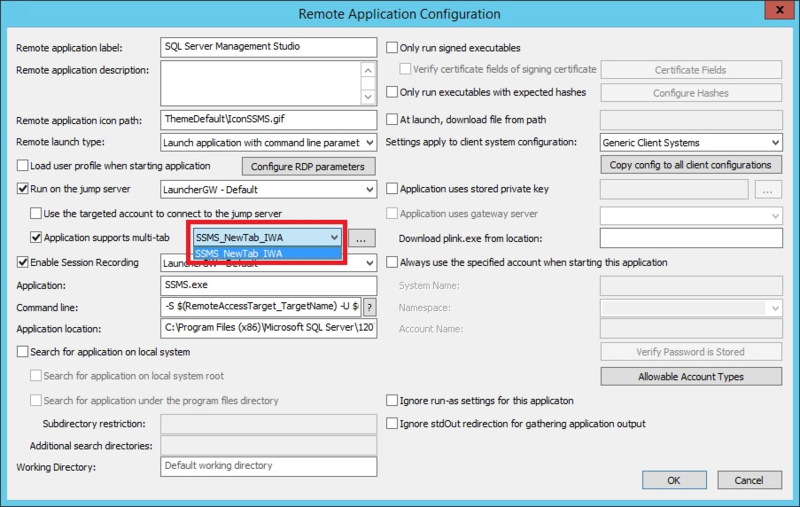 From Remote Application Configuration, enable the Application supports multi-tab option . Click the ... button. Complete all the information on the Multi-tab Configuration dialog. 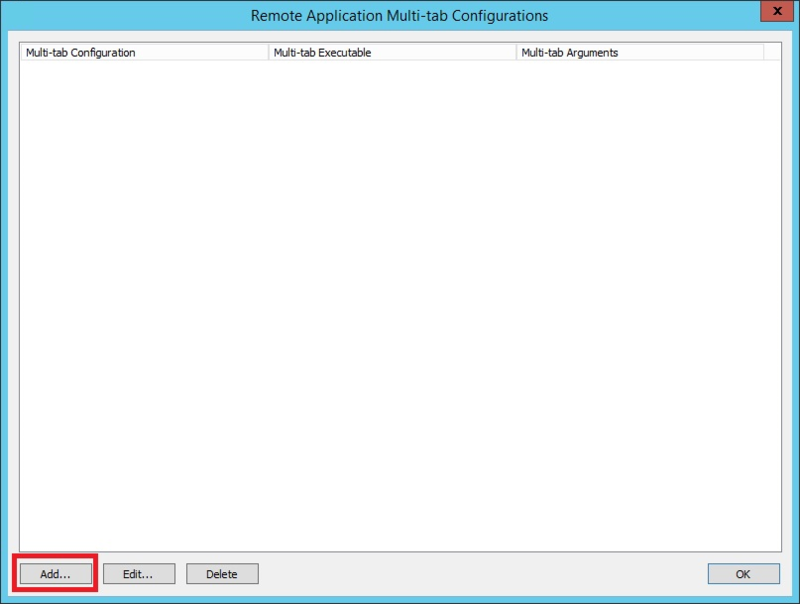 Multi-tab configuration label is a label shown in the Multi-tab Configuration selection in the Remote Application Configuration window. Multi-tab automation local executable path is a path to a compiled AutoIT script, which is able to open a new tab or establish a connection to new target system. Automation executable arguments are specific to new-tab-executables. The ProcessID is used to find the handle of the application window, and the target system is transferred to the application for a new connection. Username and password are not needed. 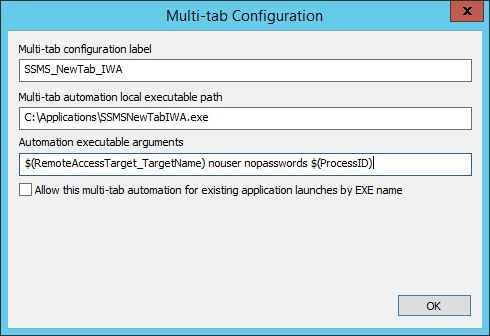 Allow this multi-tab automation for existing application launches by EXE name controls how launched applications are detected. If it is unchecked, the applications selected from the multi-tab configuration are assumed to be previously launched. ProcessID is the ID utilized to reuse the currently running executable. In the commands above, $(RemoteAccessTargget_TargetName), $(Username), and $(Password_Raw) are standard variables. $(ProcessID) is a variable that returns the PID of the initial launched application. The nouser and nopasswwords values are for username and passwords arguments. Because we use Integrated Windows Authentication, we do not need user name and password arguments. SSMSNewTabIwa.exe and SSMSNewTabSql.exe are compiled AutoIT scripts that we use to interact with Microsoft SQL Server to open new connections that use Integrated Windows Authentication or SQL authentication. Click OK. 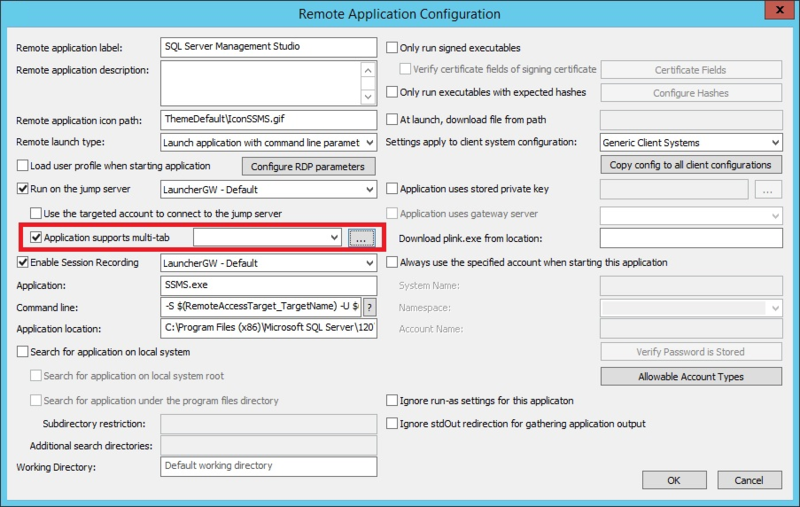 Select the appropriate multi-tab configuration settings for the target application.